From the history to the meaning, here's everything you need to know about sapphire engagement rings. The sapphire is gemstone has been a popular gemstone for centuries, and it is easy to see why. Considered to make up a quarter of the ‘big four' jewels (rubies, emeralds and diamonds take the other quarters) the sapphire is a durable precious stone that has a hardness of nine on the Mohs Scale, and is renowned for its deep blue colour. Made from a variety of the mineral corundum, this aluminium oxide stone is formed in various colours. What does the sapphire symbolise? The sapphire's name has roots in the Latin word "saphirus" and the Greek word "sapheiros", which both mean blue. It is also thought that Sapphire's name comes from the planet Saturn, as sapphire roughly translates to o mean "dear to the planet Saturn" in many different languages. The sapphire is also the birthstone for September (find out more about your birthstone here), and a traditional gift for a 45th wedding anniversary. For centuries the sapphire has been a symbol of the heavens and represents the guardian of innocence, promoter of good health, preserver of chastity and bestower of truth. Sapphire is thought to bring inner beauty, happiness, prosperity and inner peace. In the 15th Century it was believed that wearing sapphire suppressed negative thoughts. Alongside this, it was believed that sapphire had healing powers for natural diseases and conditions. It was also believed that sapphire killed snakes. Ancient Persians believed that the sky was painted blue by the reflection of sapphires, and used ground up sapphire for medicinal purposes, and Ivan the Terrible of Russia believed that sapphire strengthened muscles and the heart, and gave the person courage. Since 800 BC, sapphires have been heralded a truly precious gemstones since 800 BC. An anonymous poet once described a sapphire as, "the blue of a clear sky just minutes after sundown." Used as a holy stone in Ancient Persia's Catholic churches, to some religions the deep blue colour of sapphire was symbolic of heaven. It was also believed that the 10 Commandments were written on sapphire tablets, and they were stone of the apocalypse. For centuries sapphire has been symbolic of wealth and royalty (check out our Royal engagement rings blog here!). Kings adorned sapphire necklaces to protect them from harm, and the sapphire was chosen as the best stone for ecclesiastical rings. King Solomon of Israel wore a sapphire ring. 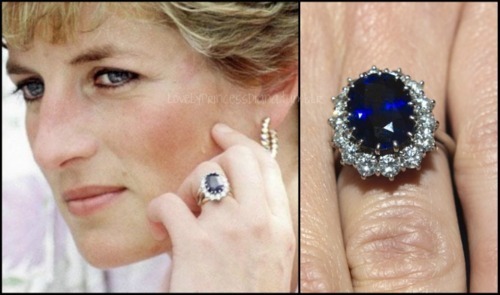 And in 1981 Prince Charles gifted Lady Diana Spencer an eight carat sapphire engagement ring. The largest sapphire in the world is in the Museum of Natural History in New York. The ‘Star of India" boasts a whopping 563 carats, and is thought to bring wisdom and truth, whilst helping to find peace of mind and serenity. Sapphires are also associated with love, as they represent fidelity and romantic devotion, which is why sapphire engagement rings are incredibly popular. Rose's Heart of the Ocean, gifted to her by former partner Caledon Hockley was believed to have been at the bottom of the ocean, amongst the wreckage of the Titanic. Little did they know that Old Lady Rose threw the gem (formerly owned by Louis XVI) back into the ocean, after an intense search. Queen Marie Antoinette boasted a stunning parure with many sapphires. The seven-piece jewelry set contained approximately 29 sapphires-many larger than 20 carats. In 1981 Prince Charles proposed to the people's Princess, Lady Diana Spencer with an 8-carat sapphire and diamond engagement ring. The stunning sapphire is surrounded by 14 diamond accents, and the late Princess's engagement ring was later passed on to Prince William's now wife, Catherine Middleton. Are you after something similar? Check out our oval cut sapphire and diamond halo ring. Javier Bardem gifted Penelope Cruz a three carat oval sapphire set in a flower bed of diamonds. This vintage sapphire engagement is truly stunning. Our round cut sapphire ring with diamond petal accents is the perfect fit. Shane Warne gave English beauty Liz Hurley a emerald cut sapphire ring with diamond accents. This stunning trilogy ring is rumoured to be worth $60,000. Check out our emerald cut sapphire and diamond trilogy ring here. Now that you know a bit more about the sapphire engagement ring's history, check out our favourite sapphire engagement rings. If you're looking for the perfect sapphire engagement ring to give to your beau, then check out our favourite sapphire engagement rings below. For tips and tricks on planning the perfect proposal, you can download our proposal guide here. If your partner loves sapphires, then this cushion cut sapphire surrounded by a diamond halo and diamonds on the shoulders is the perfect engagement ring! A statement piece of jewellery that is elegant whilst demanding attention, it will be the perfect part of "something blue". Available in white gold, platinum, rose gold, yellow gold and palladium, when you buy your sapphire and diamond engagement ring with us, you can personalise it to create the ultimate ring. Not everyone wants a huge sapphire engagement ring that demands the attention of the room. For those who want something a little different and glamorous this breathtaking cushion cut diamond ring with double halo sapphire and diamond is perfect. Choose from white gold, yellow gold, palladium, rose gold and platinum and make your ring truly unique. Less is more - especially when it comes to this beautiful pear cut sapphire and diamond trilogy ring. The pear cut sapphire exudes elegance, and the diamond baguettes on the side enhance the deep blue of the sapphire. Available in yellow, rose and white gold or platinum and palladium, you can find your dream engagement ring. Check out more of our sapphire and diamond rings here.